For other uses, see Scotch bonnet (disambiguation). Scotch bonnet, also known as bonney peppers, or Caribbean red peppers, is a variety of chili pepper named for its resemblance to a tam o' shanter hat. It is native to the Caribbean islands and Central America. Most Scotch bonnets have a heat rating of 80,000–400,000 Scoville units. [not in citation given] For comparison, most jalapeño peppers have a heat rating of 2,500 to 8,000 on the Scoville scale. However, completely sweet varieties of Scotch bonnet are grown on some of the Caribbean islands, called cachucha peppers. These peppers are used to flavour many different dishes and cuisines worldwide and are often used in hot sauces and condiments. 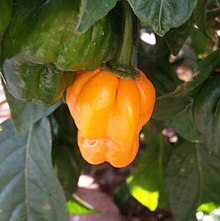 The Scotch bonnet has a sweeter flavour and stouter shape, distinct from its habanero relative with which it is often confused, and gives jerk dishes (pork/chicken) and other Caribbean dishes their unique flavour. Scotch bonnets are mostly used in West African, Antiguan, Kittitian/Nevisian, Anguilan, Dominican, St. Lucian, St Vincentian, Grenadian, Trinidadian, Jamaican, Barbadian, Guyanese, Surinamese, Haitian and Cayman cuisines and pepper sauces, though they often show up in other Caribbean recipes. It is also used in Costa Rica and Panama for Caribbean-styled recipes such as rice and beans, rondón, saus, beef patties, and ceviche. Fresh, ripe Scotch bonnets can change from green to yellow to scarlet red; however, other varieties of this pepper can ripen to orange, yellow, peach, or even a chocolate brown. ^ DeWitt, Dave (1996). Pepper Profile: Scotch Bonnet. Fiery-Foods.com. ^ Andrews, Jean (1998). The Pepper Lady's Pocket Pepper Primer. University of Texas Press. p. 147. ISBN 978-0-292-70483-1. ^ "Mead Recipes: Scotch Bonnet Capsimel". This recipe uses very hot Scotch Bonnet chillies (which are ubiquitous in West Africa). ^ "Chile Pepper Heat Scoville Scale". About.com: Home Cooking. The New York Times Company. Retrieved 2008-08-21.